At Willsmere Dental, we are pleased to provide modern dental technology so we can give the best patient experience possible. We are now offering the Swiss-Made EMS AIRFLOW and a Guided Biofilm Therapy treatment to help improve your oral health and smile! We recently installed the EMS AIRFLOW Prophylaxis Master. With this state-of-the-art system, your teeth can be cleaned with little to no discomfort. You may not even have to experience scraping and the noise involved. 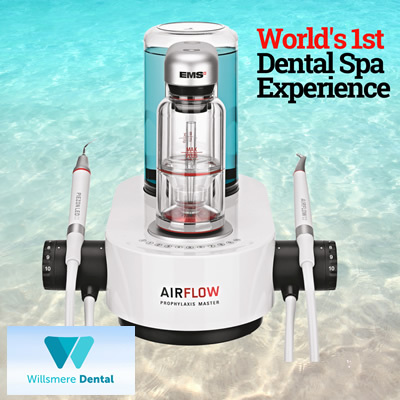 AIRFLOW is an innovative, non-contact type of dental maintenance and prevention. It releases a controlled stream of air, warm water and very fine sweet powder onto the tooth. It also focuses on tough-to-reach areas to dislodge and remove food particles, plaque, discolouration and stains. One of the greatest advantages of this system is the high-pressure water/air stream cleans your teeth quickly, efficiently and comfortably. Conventional methods of teeth cleaning are often messy, time-consuming and can leave you with a not so great taste in your mouth. AIRFLOW is similar to being at a day spa. Instead of aestheticians providing facial treatments, your dentist or oral health therapist gently exfoliates your teeth. Doe to the water in the AIRFLOW Prophylaxis Master, that is heated to 40 degrees, your teeth will feel comfortable. How Does EMS AIRFLOW and a Guided Biofilm Therapy Treatment Work? Did you know that an estimated 1mm of dental plaque contains more than 200 million bacteria? If not treated, the bacteria can multiply and develop a biofilm. Biofilm is a cluster of bacteria that can produce gum disease and compromise your body’s immune defences. 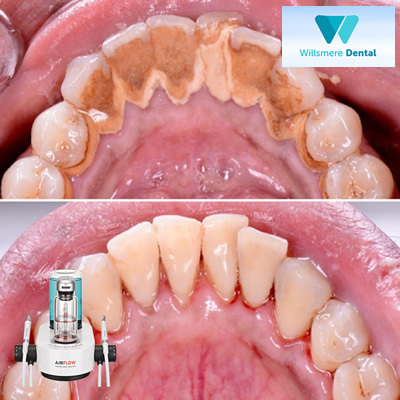 When using the AIRFLOW Prophylaxis Master device, your dentist or dental hygienist will place a coloured dye onto your teeth to expose any plaque and biofilm present in your mouth. This tool can help to encourage scrupulous oral hygiene. That’s because it shows you the areas in your mouth that you need to spend some more time cleaning at home. Next, your dentist or hygienist will use the AIRFLOW to remove plaque buildup. This essential action can help to prevent and treat gingivitis (gum disease) and periodontitis. In addition to erasing stains, AIRFLOW can be used for various types of treatment. These include cleaning orthodontic brackets and dentures plus implants to minimise peri-implantitis and to reduce the loss of implants. If your teeth are covered with hard calculus, they may also need to use an ultrasonic on your teeth. However, thanks to the AIRFLOW being used prior it minimises the amount of time in which an ultrasonic is required. See for yourself what AIRFLOW and Guided Biofilm Therapy can do for your teeth by clicking on the link below. Experience the difference that the EMS AIRFLOW can make during your next cleaning. Contact us today to book an appointment! For more information about AIRFLOW and Guided Biofilm Therapy, visit www.ems-dental.com.